At this point you should have played the Assault on Tralus - Mission 1. The battle has begun, but how it will end is up to you. The winner of the Ground Match will determine which sub-mission you will be playing. If the Rebels won, you'll be playing Ground Mission 2A. If the Imperials won, play Ground Mission 2B instead. The winner of the Space Match will be Second Player in Space Mission 2. The number of Victory Tokens gained unlock some bonuses to the Rebel list building process for Ground Combat. Unique cards eliminated in Space cannot be used in Space combat again during missions. However, they may be used in ground combat. Each surviving Ship / unique squadron is given a Veteran Token if brought to future combat rounds. For ships, the Veteran Token may be exhausted when a ship's command dial is revealed to give the ship any one command token. For squadrons, the Veteran Token may be spent during an attack to reroll any number of dice. If Luke or Vader have been given Veteran Tokens as squadrons, they may take those tokens with them to Ground Combat. 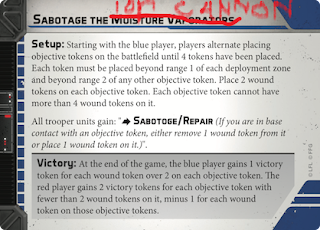 Any ground unit that finished combat with half their minis or more remaining and without being "damaged" is given a Veteran Token if brought to future combat rounds. It may spend the Veteran Token during its activation as a Free Action to gain a Dodge or Aim token. Read the following to the Rebel General: "We've pushed them back on the initial attack, but they're pushing harder this time. We've reinforced our defensive positions overlooking our evacuation point as best we can to buy us time. We need that time to fuel and load the transports. If the Imperials take these bluffs, they'll have open shots at our transports as we try to flee. You have to hold here, General." If the Rebels gained 6-7 Victory Tokens in Space Combat Mission 1 - Each Corps unit may take 1 Grenade upgrade without that upgrade counting towards the point total. If the Rebels gained 8+ Victory Tokens Space Combat Mission 1 - One Support and one Heavy may take 1 Hardpoint upgrade each without that upgrade counting towards the point total. Read the following to the Imperial General: "We are in position to begin the offensive. Drive these Rebels from the field, General." Red Player will set up on the the long top of the card. Blue Player will set up in the lower part of the card. For Key Positions, Red player will place 2 tokens, and Blue player only 1. If the Rebels win, read the following to the Rebel General: "We've pushed them back again. 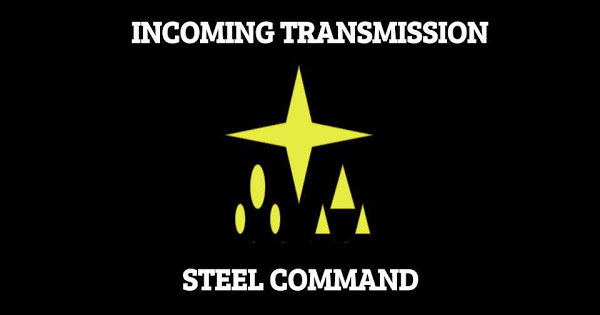 We can conduct a simple, orderly withdraw from the planet, now that our ships are refueled." Read the following to the Imperial General: "We cannot abide this failure. Push forward with everything you have right now." Proceed to Mission 3A. If the Imperials win, read the following: "The Imperials have taken the area overlooking the evacuation site, and things have suddenly gotten a lot more dicey for the Rebel evacuation." Proceed to Mission 3B. Read the following to the Imperial General: "We've found their Ion Cannon hidden near the base. They were going to use it to cover their escape, but we've caught them before they could get it online. We take this out, and they won't stand a chance against us." Read the following to the Rebel General: "They were able to figure out where we hid our Ion Cannon, and we haven't even had time to get it ready to fire. We need to hold them off while getting it online or our evacuation is going to get dicey real quick." If the Blue Player has more Victory Tokens than the Red Player, record that the "Ion Cannon is Offline"
If the Ion Cannon Is Offline, read the following: "With the Ion Cannon destroyed, the Rebels will have quite a difficult time evacuating. The Imperials already hold the high ground overlooking the evacuation point. It is now or never to escape!" Proceed to Ground Mission 3B. If the Ion Cannon Is Online, read the following: "With the Ion Cannon operational, the Rebels will be able to use it to cover their escape. The Imperials do hold the high ground overlooking the evacuation point though, so getting into space will be crucial." Proceed to Ground Mission 3B. Read the following to the Admiral who won Mission 1: "We've set up defensively over the planet while our ground forces are operating. Reinforcements are on the way, we just have to hold until they arrive. There is no doubt that the enemy is going to try to crack our line. We can support the ground forces as well from up here, but we can't let that get in the way of holding the line." You may not use any unique cards already in use by the General. You must include all surviving ships from Mission 1 (excluding any GR-75s that scored victory points). Read the following to the Admiral who lost Mission 1: "We've regrouped just outside the planet's gravity well, with some reinforcements. We need to push in and take them out now, our ground forces depend on it." Setup: The Winner of Mission 1 is the Second Player. After obstacles are placed, the Second Player must place 3 objective tokens anywhere in the setup area. The Second Player must set aside any ship or squadron that is new for this mission (did not survive the previous mission). Special Rules: At the start of any turn besides the first, the Second Player may deploy any number of set aside ships / squadrons at Distance 1 of an objective token. These ships / squadrons may not be placed overlapping other ships, squadrons, or obstacles. If the second player does not deploy any of their set aside ships / squadrons, they may move each objective token up to distance 1. If the Rebels win, read the following: "The Rebels have driven the Imperials away from the planet, and will be able to protect the evacuation, which will be starting shortly. Still, the Empire will not let its prize so easily be denied." Rebels will be Second Player in Mission 3. If the Imperials win, read the following: "The Empire has driven the Rebels away from the planet. The Rebel evacuation will be falling into a trap. 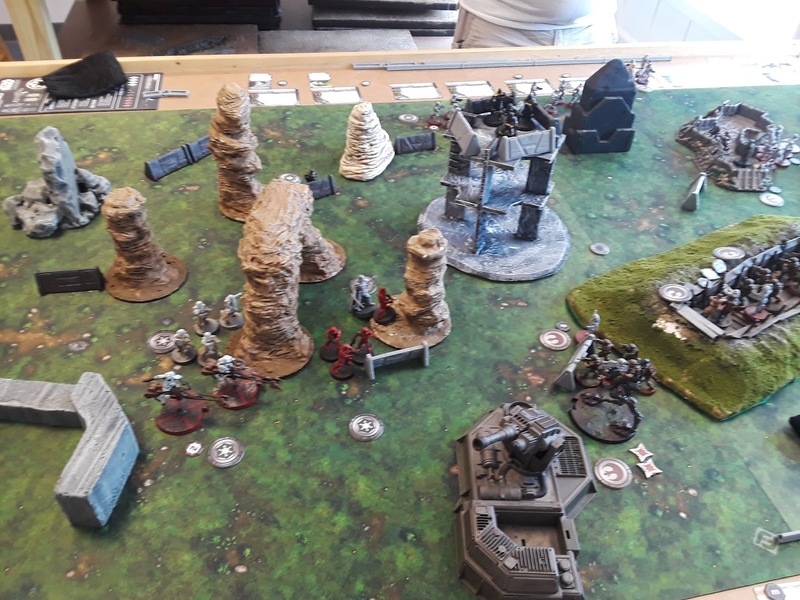 Still, the Rebels have one last desperate attempt to save their personnel..." Imperials will be Second Player in Mission 3. All Commanders, Specialists, and Special Forces gain the following Keyword - Mark Target. Mark Target - Action - Place a condition token at Range 1-2 of your unit leader's current position. At the start of the ship phase, the Second Player may choose to immediately activate one of his ships, and set aside any number of his unengaged Bomber squadrons. If he does, that ship does not attack, but instead the following attack is performed against all units (including friendly units!) within Range 1 of the condition token as though from a unit not friendly to any side. This attack is treated as though it has Line of Sight to all affected units, no cover, and Impact equal to the number of dice in the attack. At the end of the turn, remove all tokens not placed this turn. 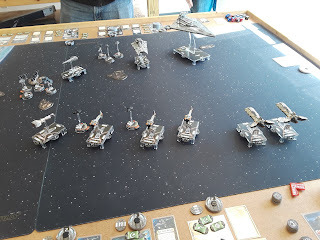 Squadrons set aside in this way are counted as destroyed for determining score at the end of the game, but are not considered destroyed or survived for purposes of end of game effects. Who Won Ground Mission 2A? What Ships / Unique Squadrons survived? What Ships / Squadrons were destroyed? What Ground Units had half or more of their minis remaining and weren't "damaged". For Mission 3 Click Here! This is top notch stuff Biggsy.